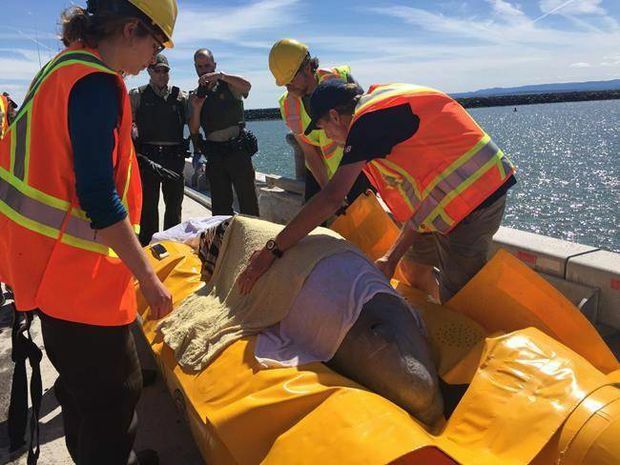 A young beluga that was rescued from a New Brunswick river and released in Quebec last year has been spotted alive and well off the coast of Nova Scotia, a marine mammal research group said Friday. The Group for Research and Education on Marine Mammals said in a statement that the whale was spotted last week near Ingonish, Cape Breton, in the company of another male beluga. A beluga whale is rescued after getting stuck in the Nepisiguit River in Bathurst, N.B., on Thursday, June 15, 2017. “According to the images that have been transmitted to us, the Nepisiguit beluga appears to be in good health. He appears vigorous and is swimming well,” said veterinarian Stephane Lair of the Universite de Montreal. The rescued whale was saved in a complex operation in June 2017 that saw the endangered marine mammal travel by land, sea and air before being returned to the sea near Cacouna, Que. The group tracked the whale by satellite in the hopes of determining whether the release would be successful, but lost track of it 19 days later. Director Robert Michaud said researchers were pleased to see the animal appeared healthy, but were puzzled as to why it travelled so far away from where it was released. He said the group will try to gather more information to find out why the wayward whale didn’t stay in the St. Lawrence Estuary, where it could contribute to the recovery of the animals’ population. In the meantime, Michaud asked the public not to get too close to the adventurous mammal in the hopes it will eventually go back home. “The best chance for these animals to return to their fellow belugas is if we minimize our interactions with them,” he said in the statement.